When my about-to-be husband and I were registering for wedding gifts five years ago, I remember combing through the online catalogues of Williams-Sonoma and Sur La Table for all manner of cooking gadgets I might finally be able to possess in my kitchen. Good pots and pans. Professional knives. Flatware that actually matched. Gleamingly new baking pans to replace my ancient, beat-up ones. Ahh, it was like the joy of Christmas, only better. Since we were living in a modest apartment at the time, I tried not to go too crazy because we simply didn’t have the storage space then. But I also tried to heed my friends’ advice to pack my registry with a lot of items to give folks an array of choices when it came to gift-giving. And then I saw it. It caught my eye and called out to me because I’d never had one or even used one before. It was a pasta machine. Not just any pasta machine, but an attachment to my KitchenAid mixer that would allow me, the carb lover that I am, to make my very own strands of fettuccine. Sigh. OK, maybe he wasn’t a killjoy. Maybe he was right. Maybe we’d never really use it. Maybe. So I clicked on to another page of culinary doodads, leaving the pasta attachment behind. Fast forward to Christmas last year. We were at my brother’s and sister-in-law’s house for the holiday. My brother Dale is a marvelous, passionate cook, and on the menu that night, among other things was — you guessed it — homemade spaghetti. My brother was going to sauce it with good olive oil, crispy bits of bacon, and lovely pungent garlic. As my brother, Dale, stood poised at the counter beside his KitchenAid mixer, I noticed my husband watching him. Dale combined the ingredients for the dough in the mixer bowl, then gave the dough a brief kneading by hand. Then, he started to feed the dough through the roller attached to the mixer that looked for all the world like an adult Play-Doh pumper machine. The roller flattened the dough effortlessly. Again it went through, and again, each time emerging a little thinner. Then, Dale changed the rollers to a cutting one, and fed the dough pieces through again, as beautiful, long strands pushed out the other end. “WHAT?! ?” I replied, incredulously, not believing what I had just heard. I reminded my hubby of a conversation five years ago. He, of course, did not remember it at all. And with that, we ordered the attachment online when we got home. And a few weeks later, it arrived on our doorstep. 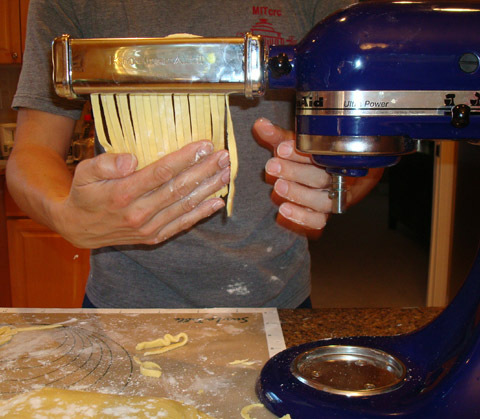 We took the three attachments out of the box (a roller, a fettuccine cutter, and a spaghetti cutter), read the instructions, and set to work, using the basic pasta recipe included. In went the flour, eggs, water, and olive oil into the bowl to be mixed by the paddle, then the dough hook. I dumped the dough onto a lightly floured counter, and began kneading it until it was smooth and soft. Then I handed the dough to my husband to have the first honor. Those are his hands in the photos. It took a little practice — some of the first dough pieces through the roller came out looking like abstract birds of a sort. But hubby soon got the hang of it. And soon, he was having the time of his life. So why go to all the fuss of making your own fresh pasta when you can pick up a container at most any supermarket or use the ever-handy dried form instead? Because the taste and texture are sublime. Fresh pasta tastes, well, fresh. You can actually taste the rich egg in the noodles, so much so that you can get by with the simplest of sauces because the noodles themselves have so much flavor and character. Moreoever, the texture is not one dimensional like dried, but rather both more chewy and more tender. Yes, it does take more time to make your own pasta from scratch. But fresh pasta cooks up in a flash, far faster than dried. Throw it into a pot of boiling water, and it’s done in 2 minutes or less. I like it with this bold tasting 5-hour pork sugo from San Francisco’s wonderful Perbacco restaurant. Yes, it does take a long time to make the sauce (actually longer than the five hours in the name of the recipe). But most of it is idle cooking. Once you have the ground pork, porcini, tomatoes, sage, juniper berries and whole bottle of red wine in the pot, you leave it alone to simmer until it reduces to a rich, thick ragu. The recipe makes enough so that you can freeze half of it to enjoy another time, too. Making your own fresh pasta is something you should attempt at least once. (We’ve made it three times this year already.) It’s not only a blast, but incredibly satisfying, too. Just ask — who else — my husband. Chop carrot, onion, celery and mushrooms in a food processor. In a spice grinder, or mortar and pestle, grind juniper, allspice, cloves and pepper. In a large Dutch oven, sweat vegetables and mushrooms in olive oil over medium heat until they become soft, 5 to 7 minutes, then add the pork, stirring until cooked through. Season with salt and pepper. Add wine, broth, mushroom liquid, herbs and spices. Bring to a boil. Reduce to a simmer and reduce by half for 1 to 1 ½ hours. Add tomatoes and simmer on very low heat for 5 hours. Add cream and allow sauce to simmer gently until it has emulsified, about 20 minutes. (If freezing the sauce, wait to add the cream until just before serving the pasta). Boil the pasta in well-salted water. If using fresh pasta, toss the pasta in butter and season it well with salt and pepper. Then serve immediately in shallow bowls, topped with 1/3 to ½ cup of sauce. If using short pasta, toss the pasta in the sauce with some butter and serve immediately in shallow bowls. Garnish with fresh Parmesan cheese. I better get him a professional manicure then. Hah! I saved those ragu recipes from Saveur, but have not yet tried them. Thanks for letting me know how wonderful they are. I can’t wait to make them now. Yum! as an Italian born and raised I have a sympathy for everything that makes pasta! I am originally from Romagna, the area in Italy that claims “invention” of egg-based pasta. My parents still run a restaurant and a catering business there. They hire a lady whose sole job is to make pasta- with a rolling pin. 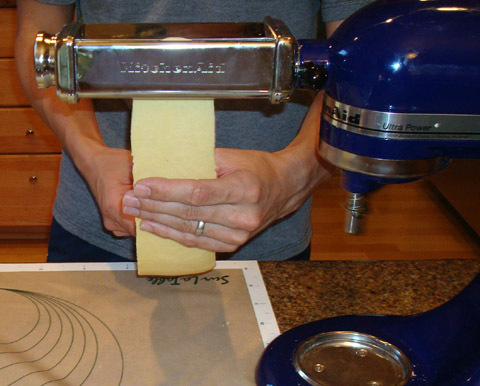 Purists say there is a very good reason why rolling pin pasta taste different than even the best homemade that uses the attachment- it’s the texture. The wood pin leaves a slightly rougher texture, which captures the pasta in a sublime way. Also, the rolled-out pasta is never completely even, which is still another plus in the texture department when it hits your palate. I buy all that, but the one reason that really sold me was: I could not believe how much faster it is to roll out pasta with a pin!! It’s a workout, sure, but you are not limited to a three-inch width! It is a breeze! As a life-long fan of the pasta machine, converting me to the rolling pin required a hands-on workshop with my parents’ pasta lady. I am a convert now! I suggest you try it out and see if you can taste the difference- Buon appetito! “Pasta Boy” just doesn’t have the same ring to it. The hook-up and the clean-up are super easy. And believe you me, I’m no techno type, either. I get a headache just trying to program my cell phone! The rollers attach very simply to the mixer. And there’s hardly any cleaning involved. Included is a stiff bristle brush that you use to brush off any dried dough from the nooks and crannies of the rollers. That’s it. You never even immerse them in water to clean. Wahoo, I’m so glad I found you! I’ve missed Bellyful!! Hmm, may have to get one. I have one attachment, a meat grinder for making steak burgers. I thought it was great until I realized that the stores will grind the meat for you, and there’s nothing to clean. Oh well. By the way, for anyone else who wondered: Sugo is Italian for juice, or sauce. popped back to tell you that the saveur recipe I tried was the one that they say was the ‘official’ ragu. I don’t have the mag in front of me now to check page number or title. I do know it has a lot of milk in it and barely any tomato paste. I made mine with Fatted Calf’s guanciale instead of pancetta and using June Taylors handmade local tomato paste, straus organic milk and hand cut marin sun farms skirt steak. My gosh, Sam! With those top-notch ingredients, one can’t possibly go wrong. The ragu sounds simply divine. I made a simplified version of Perbacco’s 5-Hour Sugo this weekend and it was wonderful. Very meaty and rich despite the fact that I used less meat, more vegetables, and no cream! I cooked it for about the full five hours but it probably did not require that long. I used quite a lot more ttomato so it’s closer to a more traditional pasta sauce. I have had one, and used it for many years. It is also good for cholesterol problems and you can make ‘egg’ noodles with egg substitute. They taste much better than the yolkless noodles in the store. I have also used it with semolina flour with great success. One of the more unusual ‘tricks’ I do with it is to do most of the pre-rolling of the dough when making Chinese Pancakes or Peking dollies, which are used for Peking Duck or MuSho dishes (pork, chicken, shrimp, or veggie). Normally the pancakes are made by pressing 2 small balls of dough into rounds, coating them with sesame seed oil, and rolling them together till thin. The cooking process produces steam that partially separates them into 2 pancakes that can then be peeled apart when done. For the rolling process I roll the pieces of dough separately in the pasta rollers till they are close to the sized and thinness I want, then coat them with the oil and finish the final rolling with the rolling pin. This saves a lot of time and effort while insuring more consistent results. You do not want to do the final rolling with the attachment as it will limit the size of the pancake, and the oil can ooze out creating a mess. That IS a great tip about using the roller for making Chinese pancakes. What a fab idea! I love this pasta press! This is the best if you want an easy to use attachment for Fresh pasta. Can i buy this attachment in Singapore? Please provide me official website details. Rohit: I would think that if you can buy a KitchenAid mixer in Singapore, you can find this attachment there. Good luck with the hunting for it. I also want to Buy KitchenAid mixer in Singapore. Please suggest me KitchenAid official website in Singapore.